Say goodbye to ridiculous bank fees. 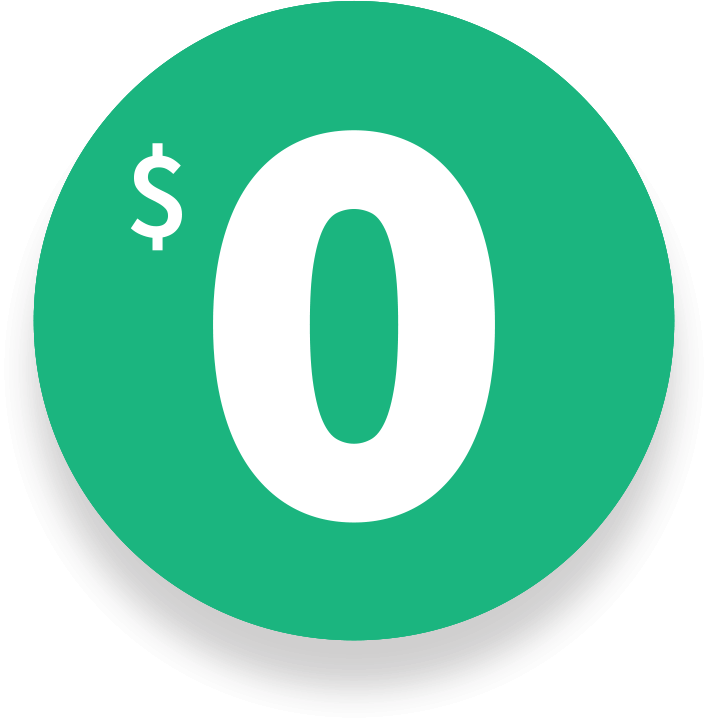 Get paid up to 2 days early with direct deposit.¹ Grow your savings, automatically. Chime’s mobile banking app enables you to manage all of your online banking on the go. With over 15,000+ five star reviews in app stores, our mobile app has everything you need with a simple, intuitive design. Finally, a banking app built by a tech company. 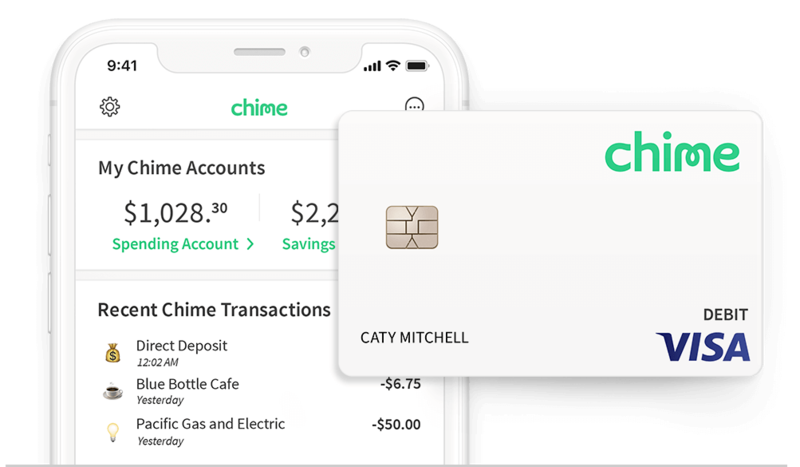 Track your account balances, daily transactions, and savings from anywhere with the Chime mobile app. Get daily balance notifications and instant transaction alerts any time you use your Chime Visa® Debit Card. Send money instantly to friends using Pay Friends on our mobile banking app. Get a notification as soon as your direct deposit is posted into your Spending Account. Never worry about paychecks getting lost in the mail. No more waiting for your money while it sits in mysterious electronic limbo. Have up to 2 more days to get ahead of your bills. Hidden fees are sneaky. We are not. That’s why Chime offers online banking with no monthly fees or open deposit required. Applying for an account online is free. There’s no opening deposit or minimum balance required, no international transaction fees, and if you lose your debit card, the new ones on us. Say goodbye to ridiculous bank fees. No monthly fees. No deposit required. 38,000+ fee-free MoneyPass® & Visa® Plus Alliance ATMs. Saving money has never been so simple. We provide automation tools that help you grow your savings without thinking about it. Chime’s Automatic Savings is an optional Savings Account with several features that allow you to automate your savings plan and achieve your goals faster. Save money while you spend. Save when you get paid. Save When You Spend: We round up every Chime Visa® Debit Card transaction to the nearest dollar and transfer the Round Up from your Spending Account to your Savings Account. Save When You Get Paid: Automatically transfer 10% of every paycheck directly into your Savings Account when you set up Direct Deposit. Your mobile and online banking security and privacy are our priority and your money is always protected. Chime offers industry standard banking security, plus a few extra special tools to keep your money safe. Your money is safe with Chime. 128-bit AES encryption, access control, and secure processes to ensure your money is always safe. Instant transaction notifications ensure you are the first to know about unusual transactions. Instantly block your card if it goes missing or you suspect unauthorized use via the Chime mobile banking app. 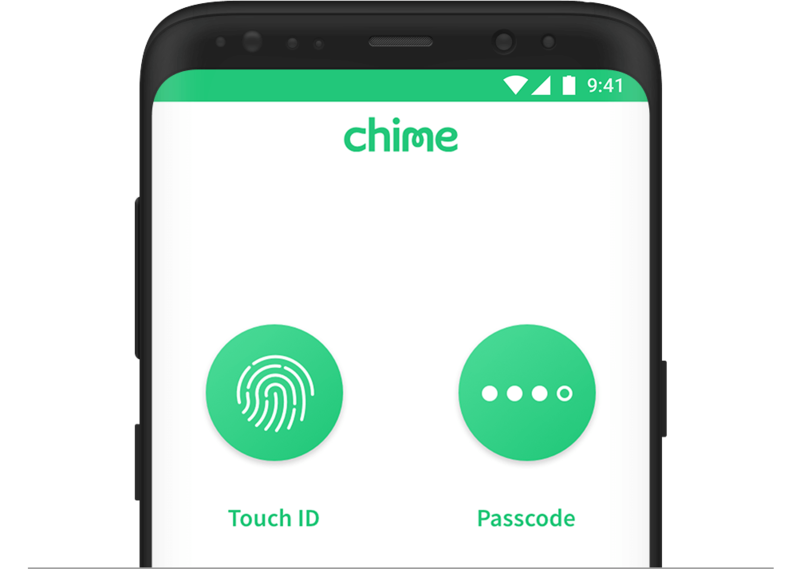 How do I open a mobile and online banking account with Chime? Visit chime.com/signup and enter your personal info and complete the enrollment form. Opening an online banking account with Chime takes less than 2 minutes. Once enrollment is completed*, we’ll send a Chime Visa® Debit Card in the mail to the address you provided. Your new debit card typically arrives in 7-10 business days. Download our mobile banking app, and log in. You can connect your existing bank account to transfer funds or set up direct deposit You can also login to online banking at chime.com when you need it. Does opening a Chime bank account require a deposit? Applying for a Chime Spending Account online is free with no opening deposit required. Is a credit check required to open an account online? ²You must notify your financial institution immediately of any unauthorized use. For specific restrictions, limitations and other details, please consult your issuer.